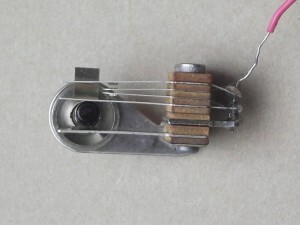 In the mid-70s, some Gibson semi-acoustics such as the ES-335 and ES-347 were fitted with coil splitting switches, which shorted out one coil of each pickup to provide a single coil sound. I think this was a nod to fashion as thanks to disco and in particular Nile Rogers, the Fender Stratocaster sound was all the rage. The Gibson schematic uses a special switch to split the pickup coils. This switch is as far as I know not available from Switchcraft. I had a customer come to me and ask me if I could get one for his guitar. I said no, but I can make you one. These switches haven’t really changed for over 50 years and thankfully it’s possible to take them apart and put them back together in different ways. Here is the old switch. The problem with it is that the extension on the long leaf which the toggle acts against has broken off. The lower long strip of metal is a semi rigid stop meaning that the toggle can only move in one direction. I transferred this part (which isn’t present on the new switch) to the rebuilt version. Here is the old switch together with a modern donor. The donor is the standard SPDT pickup switch. I ended up using all the leaves from the new switch as they were straight with new contacts. There was no point using old, damaged parts for a misplaced loyalty to originality. Of course all the old parts will be given back to the customer as always so they can rebuild the original if they ever wanted to. The only modification required was to bend the extension strip mentioned above the opposite way as on the pickup switch the contacts are inboard and on the coil split switch they are outboard. Here is the new switch open and closed so that you can see the mode of operation. Below is the second-part of a reply I sent (Nov ’15) to a guitar-playing friend of mine, when I emailed him the link to an Ebay ‘Buy it Now’ item in the US. The link directed you to a 1959 Gibson Les Paul electronics harness, the price being $18,500.00 – yes, that’s eighteen and a half grand. “… All of this was a result of searching for a half-decent wiring diagram for my 335 – hen’s teeth. There’s one that’s available from the Gibson site that I find irritating and disrespectful. I say disrespectful because it’s no more than a pencil-scrawl, by someone who’s comfortable with electronics. I’m not comfortable with schematics. I could never get my head round all those pyramid-shaped Earth symbols and long, straight lines going to curly things (pickups).Where are the labels? There are no labels, no wires, nothing that looks like my guitar. Gibson have made countless millions from ‘us’ over the decades and yet they can offer little more than a photocopy of a scrawled schematic. Do you know, I couldn’t even find, among the billions of sites, diagrams and schematics, what volume knob on my 335 is volume #1, and what is volume #2? Is volume #1 the bottom knob or the top knob? Is the bottom knob going to pickup #1 or pickup #2? Is pickup #1 the neck or the bridge? Nothing out-there that helps. Thankfully I’ve now stumbled-upon what volume is what and where it’s meant to go to. I’ve also stumbled upon – by plugging-in a lead and ‘tapping’ the pickups with a screwdriver – just where I’m supposed to solder that coil-tap switch that never worked. Yes, it’s that time of year again, when I have nobody in my house* and I get enough time to myself to address those jobs needing done but which are neglected for 10 months of the year. I bumped-into my 335 the other day, when I had to clear-out a room due to some damp. The 335 was plonked-down on one of my tables in what I call my ‘dining-room’, until I dealt with the damp problem with a sponge, a scrubbing brush and a bucket of hot-water and bleach – that was after I managed to clear the overflowing gutter, the source of the problem. Anyway, damp-proofing done and junk returned to the store room, I opened the guitar case and found the stramash of electronics just as I’d left them around this time last year. I’m not sure if I was expecting to open the case and suddenly find it had all ‘magicked’ together, just to be plugged-in and gigged/sold/hung on a wall. Well it wasn’t all magicked together, it’s all hanging-out and fucked-up and being neglected and taunting me, reminding me that it won’t assemble by itself. Anyway, I’ve progressed from where I was 12 months ago, I now have proper diagrams that I can understand, written notes to remind me (next year?) of what goes here and what goes there. I now have a clearer understanding of what I’m doing. I’m getting there. Back to the lack of a decent wiring-diagram source. I find it so frustrating that there are so many sites, experts and forums online but only a very basic Gibson schematic is what I can get my hands on. Sure, Seymour Duncan and others offer lovely diagrams in full colour, but not one of them offer a simple explanation ‘Wiring for Idiots’ that says; ‘This wire goes from the bottom volume knob to the such-and-such pickup’. 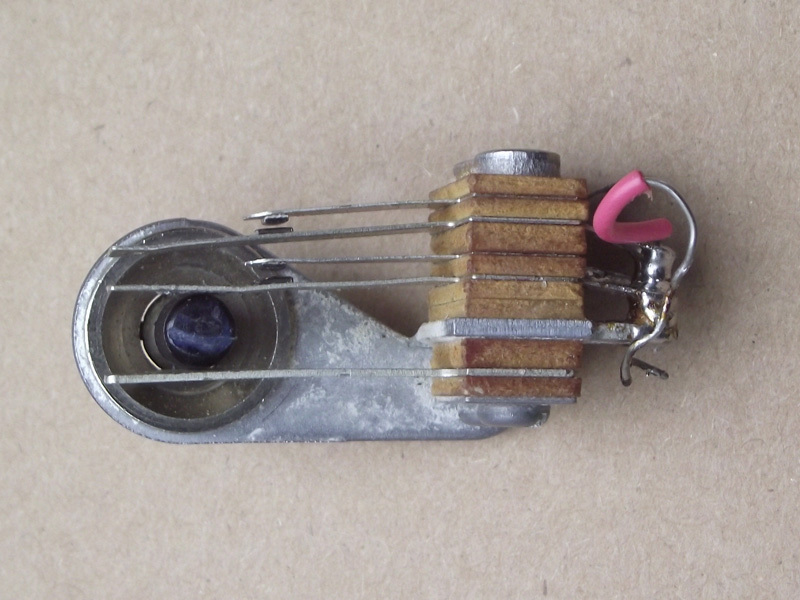 None of them offer an explanation or diagram for my old ‘leaf-spring’ toggle – which wire goes where??? And, Seymour Duncan (SD) pickups have around 5 x wires coming from each, all colour-coded etc – this is no-good to me. Also, none of them make it clear if the view they’re offering is the view ‘from above and as I look at the guitar face-on’ or from the under-side of the pot – surely this would be considered basic? It leads me to a feeling of insecurity; “If I wire it like this will it all be back-to-front?”… Yes, I’m sure the information will be out there, but I can only search-through so many sites and forums before another hour has gone and I’ve seen the same SD diagram again and again. I would’ve thought the Gibson site would have everything, and I mean ‘everything’ necessary for undertaking a stock-repair of one of their thousand-buck instruments. Apparently not. 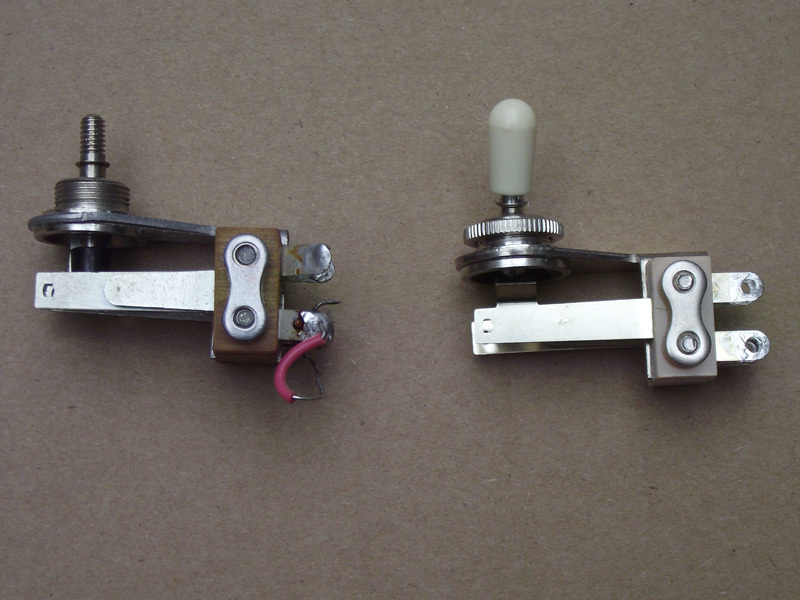 It’s quite odd, when searching for ‘ES-335 w/coil-tap’, to see a picture of my leaf-spring toggle switch in there – and when I say ‘my leaf-spring toggle switch’, I mean it’s actually the one I have laying-around beside all my other Gibson bits. I’d sent that SD pickup for repair, oh, about 2 years ago now, and also sent the leaf-spring at the same time. The Manchester guy managed to repair the toggle switch and was proud enough of his efforts to feature this repair – with some pics – on his site, and as a result, my old leaf-spring appears whenever I do a search for ES-335 w/coil-tap. I never did offer thanks to the Manchester guy for his work, probably because I never knew if his work was good or bad. However, last night’s tinkerings have proven to me that his work has indeed been successful. Someday I’ll produce a proper wiring diagram – a work of art – that will offer essential reference to the half-dozen or so guys around the globe who own a Gibson ES-335 w/coil-tap. I’m almost at the soldering-and-assembling stage. Steve, I’ll get back to you when I’ve undertaken the repair. Dear Steve, thanks so much for this article on the coil tap switch. I have an 1981 XR-1 that was meant to be a player when I bought it but has turned out to be a project that someone with the job title “guitar tech” and apparently no actual skills pronounced “healthy and hale”. It has several problems, flat neck with the truss fully loose, and previously wired by drunken monkeys, yes, I’m sure it had to be monkeys. Your article will help to getting my guitar sorted thanks. That 335 job that I never got round to.. So, as I write (Jan ’17), the guitar is currently in a music shop in Glasgow. 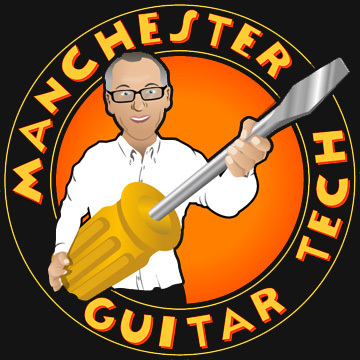 The gtr-tech there has been highly recommended by a couple of sources and it saved me from driving to you in Manchester with the guitar – for that was my intention. Long story short: I had endless problems matching a proper chrome pickup cover to the ‘Zebra’ SD pickup that you repaired some time ago. I’d bought 2 x covers online and none of them fitted ‘perfectly’, in fact the fit was extremely poor, with definite ‘spaces’ between the cover and the pole-pieces – what’s wrong with wanting a pickup cover to fit perfectly? Anyway, after being all enthusiastic and applying myself, I just got sick of all the shite again and the guitar gathered dust once more. So, my 1969 Strat needed this-and-that and I decided I’d kill two birds. The Glasgow music shop currently has both the Strat and the 335. The dude there is cleaning-up my mess for me, replacing the first twelve frets on the Strat, couple of other things, and – finally – re-wiring my 335 ‘guddle’ and getting a proper-fitting cover for the SD. I’ll probably pick the gtr up next week. I will punt that 335, no longer required. It’ll break my heart as ‘I don’t sell my guitars’. I’ve owned it since around 1982/83, gigged it for about 15 years before I discovered my Strat again. The 335 is a beautiful instrument, plays itself, sounds phenomenal. When I first bought that 335, my gtr tutor said; “That is a beautiful neck – never sell that guitar!”.. Anyway, the time has come and I’m selling the 335 for £400. Just kidding.. I’m not sure how much I’ll get for it, I’m thinking around… Jeez, I just had a peek on the Bay and saw one exactly the same as mine – coil-split switch too – going for $4789 + shipping (‘from United States’). The Sterling ‘Buy it Now’ price is around £4060.00. Hmmm? Steve, whatever I decide to do with the guitar I’ll still post a report on the repair it’s currently undertaking. I’ve owned five 335s during my playing life, two of which had coil tap switches, both were unreliable and eventually failed. 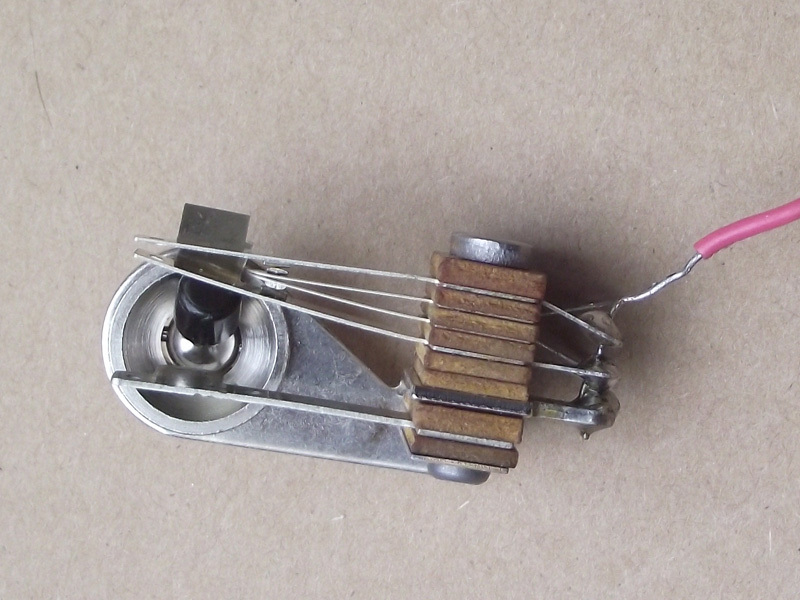 A Guitar tech in Gloucester simply replaced it with a conventional dpdt which has worked fine for 30 years. Curious as to whether this is the same type of switch assembly and chassis as the one used on the es340 for phase reversal. I’ve been set the task of returning one to standard after it was wired like a 335. Im excited to see how it turns out. The switch is similar in construction but operates differently of course. I don’t know where you’d get a suitable switch but maybe you could build one. Most people prefer the standard ES-335 wiring scheme and a lot of ES-340s are converted. Presumably some people have the switches tucked away at the back of drawers? Thankyou I’ll keep an eye out. Currently I’ve decided to arrive at the same options slightly differently but he’ll get the usability he wants.